How long was the resistance training period? Should we reject the paper? Is there anything we can conclude from this study? Wilson et al. have published a study where 25 trained lifters were divided into two groups: a keto group and a western diet group. Both groups did 9 weeks of strength training and results for hypertrophy, LBM, fat mass, etc. were collected. The results were, at face value, quite extraordinary for the keto group. There are also several issues with the study methodology and lacking reporting of conflicts of interest. If you have any comments regarding this article, please send an e-mail to adam@sci-fit.net. Sign up for the newsletter and stay updated when new articles, videos, and e-books are published on SCI-FIT! Title: "The Effects of Ketogenic Dieting on Body Composition, Strength, Power, and Hormonal Profiles in Resistance Training Males"
There is little data on the subjects. The authors state that 30 subjects joined, but 5 dropped out due to various reasons. Participants needed to have a 1.5x bodyweight squat if they wanted to be included in the study. They used DXA for LBM and ultrasound for body composition measurements. I go into more detail on this further down in the article. “Carbohydrates were reintroduced to the subjects in the KD treatment from week 10 to week 11”. 2-way ANOVA with repeated measures (time and group interactions). 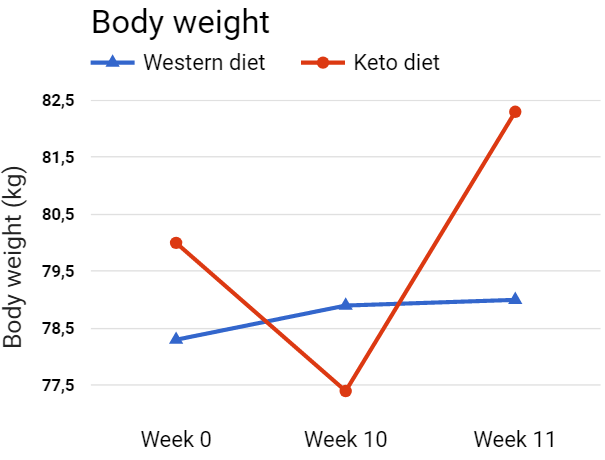 Note that the keto group gained 5 kg of total body mass in one week (10->11). They consumed the same amount of calories as they did in previous weeks. 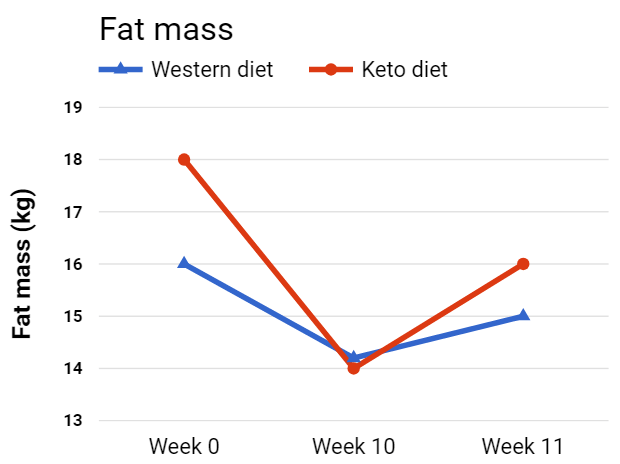 Note that the keto group had an average gain of 2 kg of fat mass in one week (10->11). They consumed the same amount of calories as they did in previous weeks. LBM was not reported in absolute numbers, but as percentages. I had to look at the graphs and try to estimate absolute LBM values. Standard deviation is not reported, only displayed. The graph below is an estimation based on my reading of the graph! After I read the baseline LBM from the graph, I used the reported percent changes to estimate absolute LBM changes. Keto group added ~9 lbs to their bench press from week 1 to 10. 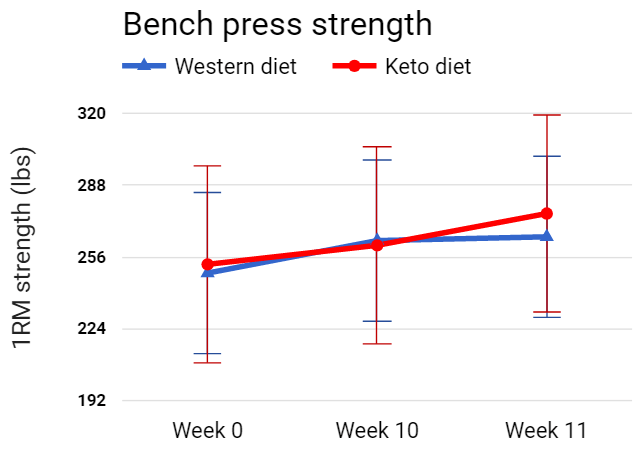 Keto group added ~14 lbs to their bench press from week 10 to 11. WD added ~14.5 lbs to their bench press from week 1 to 10. WD added ~2 lbs to their bench press from week 10 to 11. 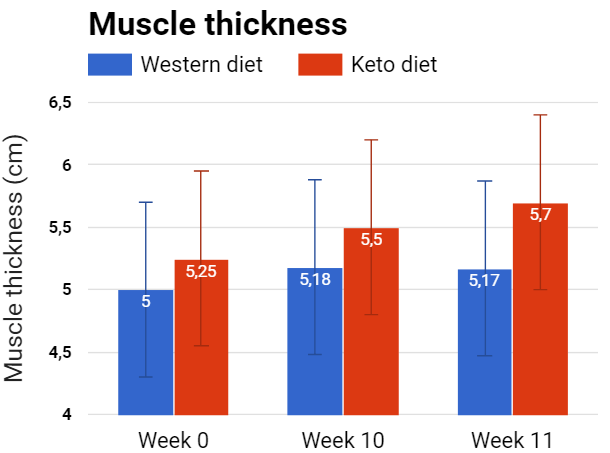 The data presented in this study suggests that both keto and WD groups gained muscle mass and strength in a caloric deficit. I’ve previously reviewed the deficit gaining literature, and concluded that it is possible to gain LBM and strength in a deficit. However, the keto group in this study lost 4 kg of fat mass while gaining ~1.5 kg LBM and increasing their muscle thickness. However, when your glycogen stores deplete (as they do with a very low carb diet), you will “lose” LBM. 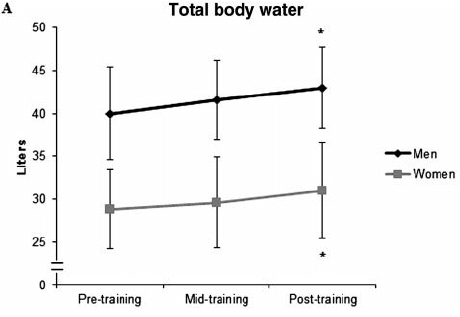 What 16 weeks of strength training does for total body water in beginners. It is very unlikely that trained lifters will have “glycogen/water gains” since these are some of the first adaptations the body makes. Generally speaking, keto isn’t known for it’s ability to build mass quickly. It is already hard to increase LBM in trained lifters, so when this study shows a LBM gain of 4.5 kg in the keto group after 7+2 weeks of RT, I’m a bit skeptical. 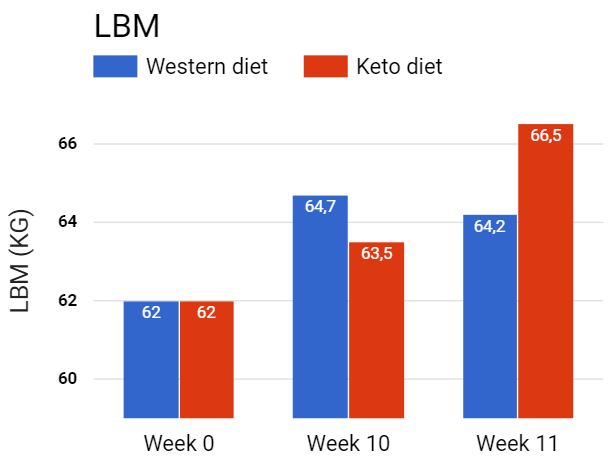 Even the 1.5 kg LBM increase at week 10 is impressive. So are the gains for WD! All these factors restrict how much gains you can make. I searched the study paper for “coi”, “interest”, “conflict”, “fund”, and “funding”. I found no mention of funding or conflicts or interests. The head researcher, Dr. Jacob Wilson, Ph.D., CSCS*D, works for Prüvit, a company that sells ketogenic supplements. Dominic D'Agostino has a patent, entitled: "Compositions and methods for producing elevated and sustained ketosis". He is funded by Patrick Arnold of KetoTech (Source 1, source 2). Further, D'Agostino has published a paper ("Cancer as a metabolic disease: implications for novel therapeutics") where he promotes ketone supplementation as a potential strategy for managing cancer. Quoted from the paper: "Conflict of Interest Statement: None declared." Jeff Volek is affiliated with Atkins diet. He has a website called Art and Science of Low Carb, and he has a book entitled "The Art and Science of Low Carbohydrate Living: An Expert Guide to Making the Life-Saving Benefits of Carbohydrate Restriction Sustainable and Enjoyable"
This alone does not mean that we should automatically discard the results of the study, as I’ve written about in this article! But, we should be aware of these COIs. Shout-out to Anthony Roberts for letting me know about D'Agostino and Volek! At the start of studies, it is customary to place a table with data about height, weight, age, and so on. This is not done in this study. They only tell you the age of the participants in the results section, late in the paper. And their weight is only shown in the results table. Height is not reported. LBM/fat mass is not reported in absolute numbers, but as percent changes. I had to look at the graphs and try to estimate absolute LBM/FM values. This could have been put in Table 3 with the rest of the data. Was it 8 or 7+2 weeks? According to the volume loads in Figure 2 in the study, it was 7 weeks of high volume and 2 weeks of tapering. The numbers here are a little strange. The standard deviation is small. Furthermore, the SD goes below the minimum required level for squat strength. Per the inclusion criteria, it is at least 1.5x BW. Given a normal distribution, several subjects would fall below 1,5x. Thanks to Jorn Trommelen for pointing this out. Thanks to Greg Nuckols for running the statistical test to check the probabilities. "After a visual inspection of boxplots in order to identify any outliers, a normality test (i.e. Shapiro Wilk) confirmed the normality of the data"
The participants also had an average of 5.5 years resistance training experience. This suggests that, on average, the subjects lifted weights since they were ~18 years. This is kind of impressive, given everything that happens during these transition years. It’s not impossible, but it is impressive that the researchers originally found so many people at this age with this type of experience. Citation (12) is entitled: “Effect of a Geriatric Consultation Team on Functional Status of Elderly Hospitalized Patients”. I haven’t been able to figure out how it connects to DXA CV. Looks like they just linked a random study. A poster-presentation from the study was published in 2014. In the presentation, it is stated that 26 participants were part of the study. However, the 2017 publication states that 25 participants were in the final analysis. Thanks to Philip Bloem and Jorn Trommelen for pointing this out! The abstract is formulated in such a way that it selectively interprets the data and favors keto. I’m not going to go into a whole discussion of the accuracy of these body comp measurement tools. Sufficient to say, all measurement tools (even MRI) are affected by carb intake. Muscle glycogen loading and depletion affect the results (Nygren et al., 2001; Rouillier et al., 2015; Bone et al., 2016). As discussed under “Are the gains realistic?”, lifters with an average of 5.5 years of lifting experience generally don’t make quick gains in muscle or strength. Especially if they are on a low-carb diet (low glycogen) and are eating at a deficit. Hence, we are likely looking at changes in muscle hydration. Wilson et al., have a reputation among some experts for publishing results that are extraordinary and unusual. And they don’t disclose COI. Check out this letter to the editor by Stuart M. Phillips, Alan A. Aragon, Shawn M. Arent, Ben Esgro, D. Lee Hamilton, Eric R. Helms, Menno Henselmans, Jeremy P. Loenneke, Kevser Ermin, Layne Norton, Michael Ormsbee, Brad J. Schoenfeld, Matthew Vukovich, Colin Wilborn, and Darryn Willoughby. First, I want to state that we should reject or accept a paper based on its quality. This means we must read beyond the abstract and conflicts of interest. We must dig into the meat and bones of the paper. The more errors and strange data, the more likely it is that something is off. If we ignore the results from weeks 10 to 11, the study suggests that ketogenic diets might be worse for LBM and strength. It should be said that I’ve been very nit-picky in my analysis of this study. Very few studies are so good that they would be able to survive such scrutiny. In fact, it is said that we should be somewhat lenient when criticizing studies, because researchers are often constrained by financial resources and other limitations. Furthermore, it can be argued that the carb refeed was necessary so that both groups had equal amounts of glycogen when the testing was done. This would give us fairer results, than comparing glycogen depleted subjects to subjects with normal glycogen levels. 'However, there are some issues. A one-week carb refeed might lead to glycogen supercompensation and excessive water retention. DXA is highly sensitive to changes in water weight, and it is generally not recommended to make large dietary changes right before a measurement. To fix this, the study would have needed either a 4C measurement analysis that could account for water weight, or the carb refeed would have had to occur over a longer period of time (i.e. 2-3 weeks). Since they didn't use 4C to check water weight, I don't think they should have done a refeed. This is because LBM and muscle thickness measurements are strongly confounded. Is the refeed truly justified in terms of external validity / ecological validity? From the abstract, it is clear that the authors are making claims about external validity (the usefulness of keto for lifters). If they just did carb refeed to check how DXA and ultrasound measurements are affected, then it wouldn't be much of an issue. There is, however, a problem when they interpret the findings the way they do.